The technology transfer from the laboratory to innovative fabrication sites is one of the major pillars in the mission of AMO. The transfer of key enabling technologies (KET) accumulated in AMICA, the nano laboratory of AMO GmbH, in past and current research projects to innovative groups at University and industries is therefore of major interest. For all these partners AMO offers the perfect equipped CMOS-Cleanroom. A great amount of requests comprising the use of AMO’s advanced lithography targets the manufacturing of masters and templates used for imprinting purposes. By utilizing all available cleanroom equipment AMO offers a highly flexible platform for processing templates. The specifically used lithography technique depends on the requested minimum feature size, pitch and other specific parameters of the master. The structures are then transferred into the substrate via Reactive Ion Etching. Other fields of application of advanced lithography comprise the processing of structures with a very low required minimum feature size, which is typically required for the highly accurate and flexible fabrication for nanoelectronics & nanophotonics. These demands are satisfied by the usage of the e-beam lithography. For more details on the possibilities in this realm please refer to the corresponding FactSheets (“Masters and Stamps” and “E-Beam Lithography“) in the sidebar on the right-hand side. 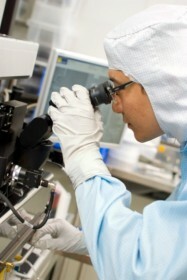 AMO offers research, development and small scale production of silicon nanophotonic devices and circuits. 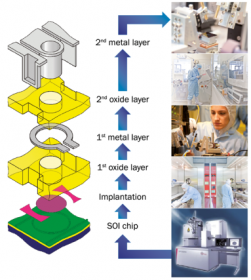 AMO´s advanced baseline processes cover a wide range from single passive nanophotonic chips up to 6” wafer processing with active nanophotonic devices and two-level metal interconnects. A summary of details can be found in the corresponding FactSheet “Nanophotonics” in the sidebar on the right-hand side. Mechanically exfoliated graphene-flakes are ideally suiting for applications in fundamental and applied science where highest crystalline quality is required and a low crystallite size can be accepted. AMO offers the fabrication of graphene transistors and can also support your own process development as part of its Graphene Foundry Services. Catalytically produced graphene is appropriate for all areas in which large-scaled graphene is needed, such as transparent electrodes or functional coatings. AMO offers different custom-made substrates to facilitate your research with graphene. Details to every single above mentioned point can be found in the corresponding FactSheet “Graphene” in the sidebar on the right-hand side. The transition from micro- to nanoscale CMOS is the major challenge for the semiconductor industry during the next decade. Simple downscaling of device dimensions may not be sufficient to achieve the ambitious goals set by the Semiconductor Industry Association (SIA). Since the beginning of the year 2000 AMO has been involved in several projects focussing on different aspects of CMOS technology, ranging from new transistor concepts for end of roadmap scaling to devices with new materials like high-k gate dielectrics, metal gates and silicides. The team at AMO has developed a flexible CMOS process platform that can be fine tuned for a variety of research and development applications. If you are looking for an experienced partner to demonstrate SOC feasibility in bio-chips, sensor-applications or MEMS/NEMS, we are the right address! Please refer to the corresponding FactSheet “CMOS” in the sidebar on the right-hand side.